You could get by without us. This adapter takes serial data and displays it on your TV. 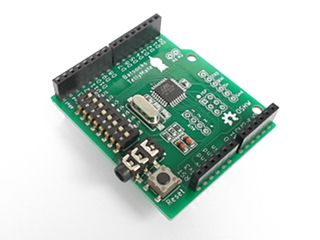 The Batsocks TellyMate Shield, suitable for the Arduino. The Batsocks TellyMate Tiny TTL, suitable for use with 5v TTL serial signals. These variants use exactly the same firmware and have identical output circuitry. If you'd like to make your own, then schematics, source code and pre-compiled .hex files are available for download. It has a wide range of uses, from a simple debugging tool, all the way to a games console display (erm - possibly). We use ours as a debugging/logging tool - it's often displayed on our computer monitor as Picture-in-picture whilst we're writing/debugging code. Because of it's autobauding capability, the TellyMate will happily take its data from sources with non-standard baud rates. That means it can receive data from internally clocked AVRs. Even tiny AVRs without a serial module can be easily programmed to output suitable serial signals. 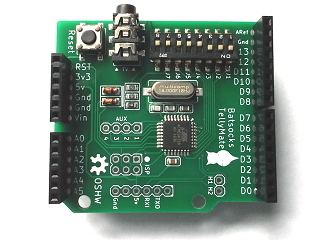 A sample program for a Tiny13 is available to download. A (very) simple skiing game (T13 + a few buttons) is in the pipeline available for download (Many thanks, Keith!). The baud rate is selected by jumper (see the User Guide). When configured to "autobaud", a power-up or reset will cause the TellyMate to look at the first few bit-transitions in the serial data it receives to determine the baud rate. The format of the output signal (PAL or NTSC) is determined by a jumper (see the User Guide). All the Source Material is released under a simple FreeBSD style licence. See the code for details. A couple of (optional) circuits for RS232 signal translation are shown on the schematic. These resources are available for downloading, below. Please feel free to make your own version (that's the point of making the source materials available! 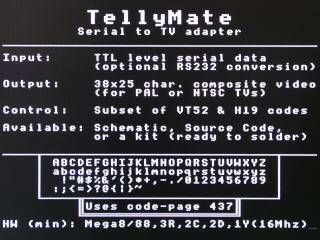 ), but do not use the TellyMate trademark without an explicit license. See the 'About Us' page for details. An in-depth article covering the design is available in our Read Me section.